It's easy to create budgets that automatically repeat so you can track your expected earning and spending into the future. Sometimes budgets need to be updated so that they better reflect actual transactions. If you're changing a budget that is part of a repeating budget, we'll ask you how you want to apply the changes you make. Learn more about repeating budgets, how to edit them and how to apply your changes! Repeating budgets are a handy way to automatically project your future earning and spending if you know that certain budgets will always reoccur. Once you create a repeating budget, multiple instances of it are automatically created for you based on the frequency you've chosen for the budget. Because your forecast is determined by your budgets, this means you'll have an accurate forecast that takes into account future earning and spending. You'll also be able to rest easy knowing that your repeating income and expense transactions are tracked against their budgets into the future! There are two main types of categories in PocketSmith - bill or scheduled income categories and regular categories (non-bill or non-scheduled income categories). When you create repeating budgets for these, they are each treated and displayed differently on the Budget page, the Trends page, and the Income & Expense Statement. You can choose whether a category is bill or scheduled income or a regular category when editing the category. The way in which you have your category set up will then be applied to any budgets for that category. PocketSmith will evenly distribute the budget for regular categories on the Income & Expense Statement according to the date range being viewed. Similarly, if John has the date range November 1 - November 14 selected when viewing the Income & Expense Statement, the budgeted amount for his 🍬Treats category will show as $42. Similarly, if Sally is viewing the date range November 1 - November 14 on the Income & Expense Statement, the full $90 will appear in the budgeted column for the ⚙ Insurance category. Sometimes, your actual earning and spending might vary from your planned budgets. It's easy to update (or delete) your budget so that it more accurately reflects your finances. If you want to delete a repeating budget, you'll need to choose how this deletion is applied. Because a repeating budget has multiple budget events attached to it (based on the frequency you've chosen for your budget to repeat), you can apply actions to just one budget event, the whole repeating budget or all future budget events. This will only delete the current budget event you have selected to delete (within the repeating budget series). This will delete all budget events from the selected date moving forward. Any previous budget events in the repeating budget series with remain in your PocketSmith history. This will delete the entire repeating budget series - all budget events in this particular repeating budget series will be deleted. If you have more than one budget (for example, you might have two different repeating budgets set up for the one category), selecting this option will remove any budget you have associated with the category. 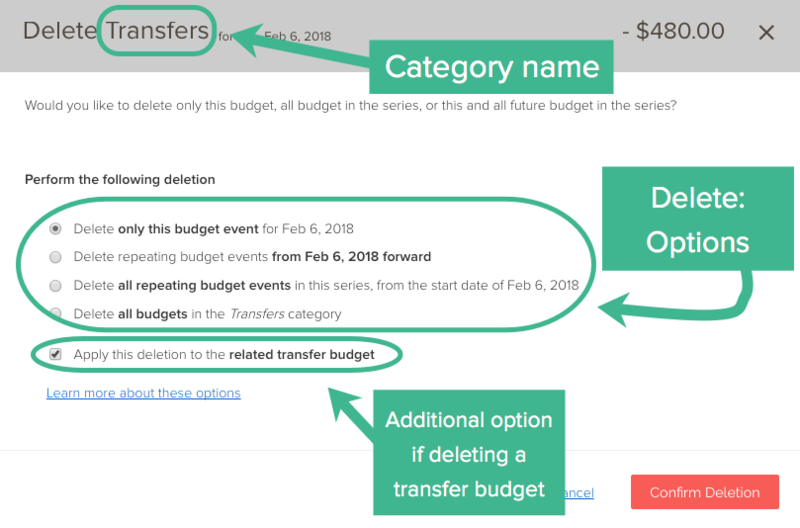 If you are deleting a transfer budget, selecting this option will simultaneously delete the budget associated with the other side of the transfer. If you make changes to a repeating budget, you'll need to choose how these changes are applied. Because a repeating budget has multiple budget events attached to it (based on the frequency you've chosen for your budget to repeat), you can apply actions to just one budget event, the whole repeating budget or all future budget events. This will edit just this one budget event in the repeating budget series, leaving others unchanged. This will stop the current repeating budget sequence from the date selected and will start a new one from that date with the updated details. 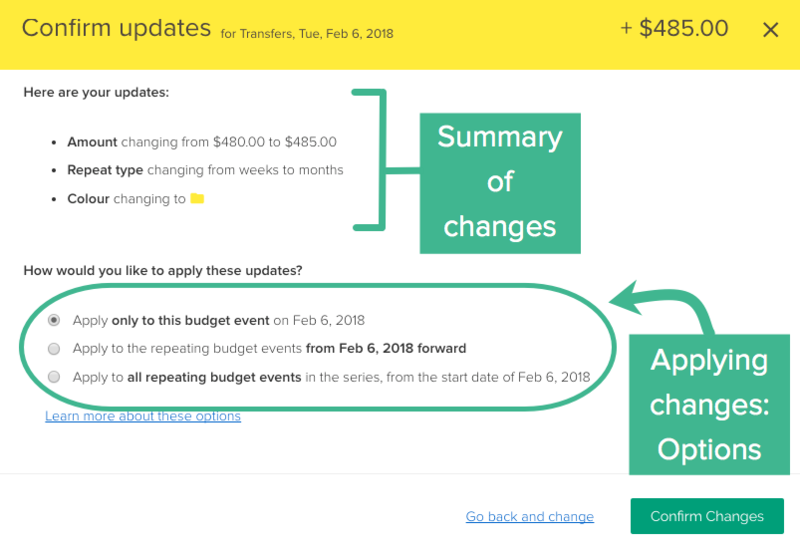 This option is useful when you change a budget but you don't want the past budget and forecast to be affected, only budgets from the date you have selected. This will edit all events within the repeating budget. This means that all scheduled budgets from the start date until the end date (if one was added), apart from existing one-off exclusions from previous "Only this event" edits. If the recurring budget began before the current day, this means that the historical forecast balances for your accounts will be changed. This shouldn't cause any issues with the future forecasting balance due to the forecast adjustment events. The following user guide has more information about the forecast adjustments: Balance correction events on the calendar.